'Jyothi' means Light and 'Linga' means the symbol of Lord Shiva. Jyothirlinga is the Radiant symbol of Almighty Shiva. "Sourashtre Somanadham, cha Srisaile Mallikarjunam, Ujjayinyam Maha Kalam, Omkaram, amaleshwaram, Paralyam Vaidyanatham, cha Dakinyam Bhimasankaram, Sethubandhe thu Ramesam, Nagesam thu Darukavane, Varanasyam thu Viswesam, Trayambakam Gouthami thate, Himalaye thu Kedaram, Ghushmesam cha Shivalaye, Ethani Jyothirlingani sayam pratha paden nara, Saptha janma krutham papam smaranena vinasyathi. Eteśāṃ darśanādeva pātakaṃ naiva tiṣṭhati karmakṣayo bhavettasya yasya tuṣṭo maheśvarāḥ"
"Somanath in Saurashtra, Mallikarjunam in Shrisailam,Mahakaal in Ujjain, Mamleshwar in Omkareshwar, Vaidyanath in Parali, Jharkhand, or Parali in Maharasthra, Bhimashankaram in Dakinyam, Ramesham (Rameshwaram) in Sethubandh, Nagesham in Daruka-Vana, Vishwa-Isham (Vishvanath) in Vanarasi, Triambakam at bank of the river Gautami;(Godavari), Kedarnath in Himalayas and Grushnesh (Gushmeshwar) in Shivalaya. One who recites these 12 Jyotirlinga names every evening and morning is relieved of all sins committed in past seven lives. One who visits these, gets all his wishes fulfilled and one's karma gets eliminated as Lord Maheshwara will get satisfied by his/her worship." The Jyotirlinga is the Supreme Siva, the Supreme Reality, out of which Shiva appeared in another Form, Lingodbhava. According to Shiva Purana, Once Brahma-God of Creation and Vishnu-Lord of Preservation had an argument as to who was supreme. To settle the debate, Lord Shiva appeared as a huge Infinite Pillar of Light Known as Lingodbava in sanskrit and pierced the three worlds. "Linga" means Symbol of Lord Shiva and "Udbava" means Born out of/Birth or Creation. Lingodbava means the "Birth or Symbols of Pure existence". Vishnu and Brahma split their ways to downwards and upwards respectively to find the end of the light in either directions. 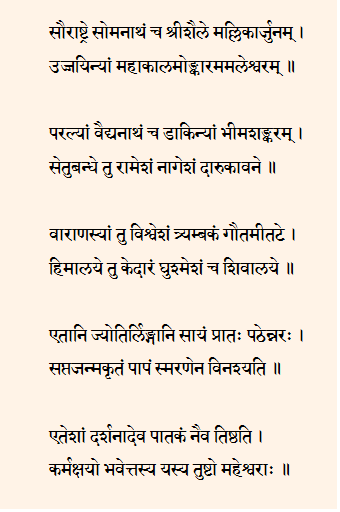 Brahma lied that he found out the end of the Light or top part of Lord Shiva, while Vishnu conceded his defeat. Lord Shiva cursed Brahma that he would not have pooja or multitude temples constructed in his favour like other gods. Except for few Brahma temples like Pushkar in Rajasthan or Brahma Temple in Trichy in Tamil Nadu, Temples for Brahma are rarely found. The Lingodbava later became the Holy Mountain Arunachala, located in Tiruannamalai town in TamilNadu. 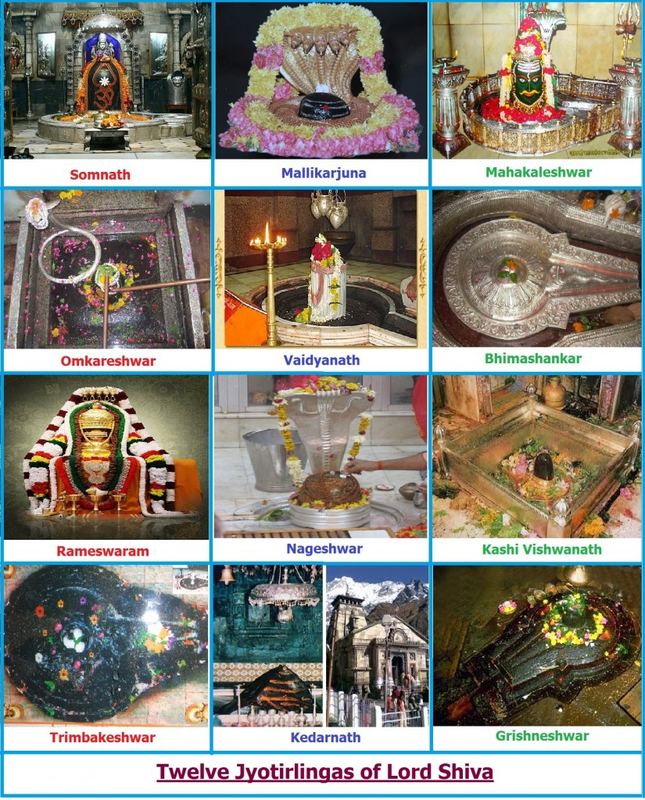 In the 12 Jyothirlinga shrines, the primary Lingam is found which represents the beginningless and endless Stambha or pillar, symbolizing the infinite nature of Lord Shiva.